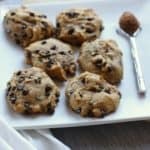 These vegan pumpkin chocolate chip cookies are a healthy twist on a classic favorite! They’re soft and cakey, almost like a muffin top. Perfect to make for a party! Combine the pumpkin, oil, applesauce, and sugar until mixed. Slowly add in the flour, baking soda, baking powder, salt, cinnamon, and ginger. Drop spoonfuls onto a cookie sheet and pop it in the oven for 8 minutes. My oven tends to run hot so yours might need a couple extra minutes. Just be sure they don’t burn on the bottom! Once they’re done, take them out of the oven and immediately transfer onto a plate or cooling rack.